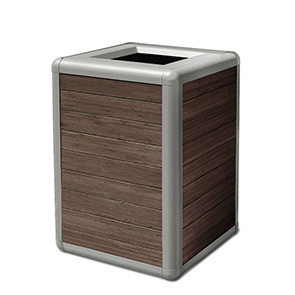 Maintain clean facility spaces and fresh aesthetics with naturally appealing Bamboo Beacon Hill 35 gallon waste receptacles. Sustainably stylish, the contemporary style powder-coated aluminum frame showcases the distinctive 1" x 4" bamboo planks, with a UV-resistant stain finish, available in either a vertical or horizontal pattern orientation. 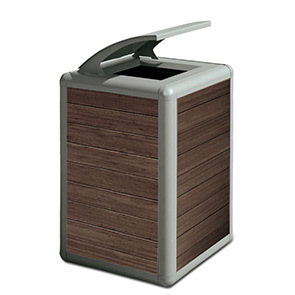 Beacon Hill bamboo units feature a choice of tapered bonnet top or open top lids which securely attach to the base and conveniently lifts off for easy servicing of the high-density polyethylene liner. These expertly crafted receptacles feature material specific protective finishes, rubberized adjustable leveling feet and pre-drilled holes for portable or fixed mounting—easily accommodating an array of indoor and outdoor applications.